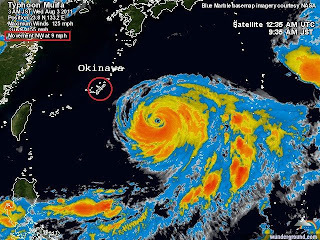 This will be the strongest typhoon to hit Okinawa in 12 years. It will be a category 4 and it will be hitting us directly beginning tomorrow but strongest Friday morning. Sustained winds 132mph, gusts of 161mph. 1st Day of School- 1st and 2nd Grade! 3 Years of Cuteness- Happy Birthday Parker!